Egypt's President Abdel-Fattah El-Sisi discussed on Saturday the upcoming 2018/19 fiscal year budget with PM Sherif Ismail and a number of officials and cabinet ministers, who briefed the president on ongoing efforts of their respective ministries, according to a statement by the presidency. During the meeting, Finance Minister Amr El-Garhy told the president that the government aims for a primary surplus of 2 percent of the GDP, reducing the budget deficit to 8.5 percent of the GDP. Last March, the Egyptian government approved the budget for fiscal year 2018/19, which targets a GDP growth rate of 5.8 percent. The new budget includes investments worth EGP 100 million, up from EGP 70 billion the previous year, to be spent on national projects and public services. The budget has been referred to parliament for a vote. El-Garhy told the president that the country saw a primary surplus in its first 10 months of fiscal year 2017/18, which started in July 2017, for the first time in 15 years. According to the minister, the surplus of EGP 7 billion, 0.2 percent of the GDP, was achieved due an increase of 35 percent in public revenues, which reached EGP 578 billion. The increase in public revenues was due to an increase in tax revenues by 45 percent, reaching EGP 471 billion. El-Sisi was also briefed on the outcome of the 2017/18 fiscal year, which included a reduction of the budget deficit to 9.8 percent of the GDP from 10.9 percent the previous year. El-Sisi told the ministers to continue with the "sound implementation" of the country’s economic reform programme, stressing the importance of increased spending on sustainable development, health, education, infrastructure and social security. Electricity Minister Mohamed Shaker briefed the president on his ministry's efforts to increase the capacity of the national electricity grid to accommodate the increase in consumption over the coming period. 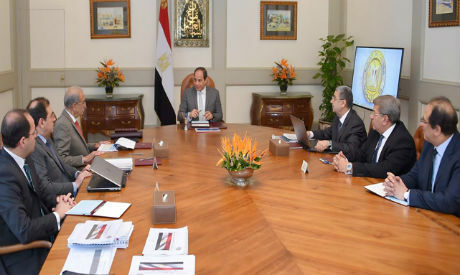 Petroleum Minister Tarek El-Molla briefed El-Sisi on efforts to boost the energy sector's performance.